It’s 7am at the kidney dialysis room at the Children Hospital 2 in HCM City and the crowd of parents with their children has become a familiar sight to doctors. Chung Kim Tiên, 41, from the southernmost province of Cà Mau, said that to make it in time for the 7am session, she had to leave her rented lodging in Thủ Đức District of HCM City at 6am. Sitting beside Tiên, her gaunt and scrawny child Tô Cẩm Lụa is trying to finish her breakfast before four hours of dialysis – not exactly the most pleasant experience. Barely 14 years old, Lụa already has six years of dialysis at the hospital under her belt. “Six years means six New Year festivals spent at the hospital and relying on the kindness of benefactors here, I honestly wonder when this will all end,” Tiên said with a sigh. The clock strikes 11am, the dialysis room opens and immediately an elderly woman rushes in to prop up her 14-year-old grandchild, who seemed to be about to collapse. The 70-year-old Nguyễn Thị Nguyệt had already arranged for a folding bed near the staircase for the child to lie on. “After dialysis, she really needs to rest for at least 1-2 hours before we can go home,” Nguyệt told Vietnam News Agency. Even more of a veteran than Lụa, Nguyệt’s grandchild, Lê Diễm Kiều, from the Central Highlands Province of Lâm Đồng, has been treated here for more than seven years, treatment which forced Nguyệt to move to HCM City to accompany her grandchild. Previously, the pair rented a room near the hospital and lived with three other families with children in need of dialysis. For the last three years however, they have lived in a shelter in Thủ Đức district where good-willed people have provided free lodging and meals for the patients and their caretakers. Hoàng Ngọc Quý, Head of Artificial Kidney Unit under the Department of Kidney – Endocrine, The National Children Hospital 2, said currently, they are providing dialysis for 40 children with late-stage kidney failure. Similar to adult patients, children need dialysis every three weeks, with each session lasting four hours, in addition to rigorous medicine and dietary regimes. Still, dialysis is really just a temporary solution to extend the lives of the patients. The permanent solution would be a kidney transplant. 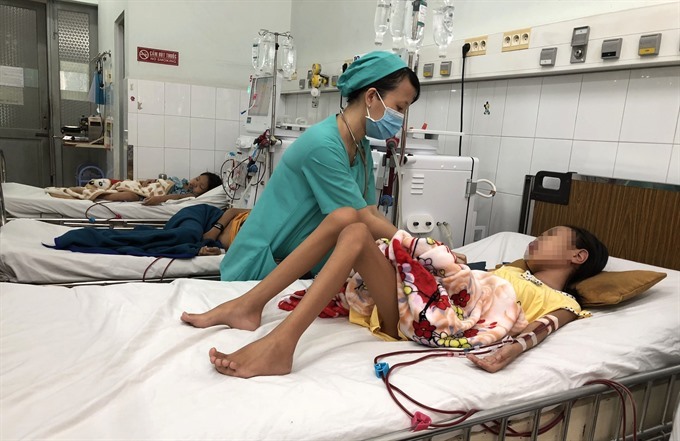 Organ transplants are frequently seen as the light at the end of the tunnel for children afflicted with fatal diseases, but few such operations occur in Việt Nam due to organ shortages and mismatching policies. In recent times, some children have received organ transplants at the Children Hospital, but the donors were all close relatives and not from outside their family. Children Hospital 2 said they are also treating patients with congenital biliary atresia (unusual narrow or blocked bile ducts) who need organ transplants, otherwise, a life-saving surgery would need to be performed every 9-15 months. In 2004, the National Hospital for Paediatrics and Children Hospital 2 in HCM City were the first two medical centres in the country to perform paediatric transplants. However, 14 years on, for Children Hospital 2, only 28 transplants have been carried out and limited to just kidney and liver transplants, meaning that each year, the hospital carried out a meagre two operations on average. “It’s not due to limited capacity of the medical staff, but the supply of donated organs for children is too scarce,” Trịnh Hữu Tùng, director of the hospital, said. Organ donation is a touchy issue in Viet Nam, as the belief in reincarnation dictates the body remains intact for the dead to be reborn in another life. The number of people registered for tissue and organ donation has remained very small, according to Nguyễn Hoàng Phúc, deputy director of the National Co-ordinating Centre for Human Organ Transplantation. In the cases of children organ donors, the shortfall is even more severe. Director Tùng attributed part of the problem to Article 5 in the Việt Nam Law on donation, removal and transplantation of human tissues and organs (passed in 2006) which forbids children under 18 years old from donating organs. “It’s understandable as taking away an organ from a developing child would adversely hinder their growth, but the policy has forgotten to make an exemption for brain-dead children, who make up a primary source of organ donation,” Tùng said. Other countries have allowed such practice to take place. In the US, there are about 30,000 organ transplant cases a year and children are given priority before adults, especially regarding lung or kidney needs. Thanks to this preferential policy, while the number of patients waiting for organ transplants keeps mounting, the rate and number of children patients on the list is decreasing. “A simple amendment on Article 5 allowing brain-dead children to donate their organs would be perfect,” Dr Trần Đông A said. Rectifying this restriction in the law would not only mean an ampler supply of donated organs, but also make the doctor’s work easier, he claimed, as using a child’s organs lessens the risk of rejection and post-transplant complications. Recently, three major hospitals in the HCM City – Chợ Rẫy, Thống Nhất, and Children Hospital 2 – signed a co-ordination agreement on humanitarian donation and transplants on October 16. Per the agreement, when there are donated organs from the brain dead, Chợ Rẫy and Thống Nhất hospitals would expedite the process and move child patients up the donation list at the Children Hospital 2. Professor Trần Đông A said this was a positive development for organ transplants in children, but in the long term, amendments to the law would be needed to increase organ supplies and save lives.